Bankart tear is a specific injury to a part of the shoulder joint called the labrum. Labrum is a ring of fibrous cartilage that surrounds the glenoid and stabilizes the shoulder joint. Bankart tear leads to recurrent dislocations, feeling of looseness, lack of strength, pain, or clicking and arthritis of the shoulder. Shoulder instability may be caused by injury, falling on outstretched hand, repetitive overhead sports such as basketball, volley ball, or weight lifting. Patients with shoulder instability may have severe pain, swelling, popping or grinding sound, partial or complete dislocation, loss of sensation or partial paralysis, and loss of function. If conservative treatments such as immobilization, prescription medicines, physical therapy, closed reduction or manipulation, and occupational therapy fail to relieve the shoulder instability, Dr. Patel may recommend reparative surgery. This arthroscopic surgery involves repair of the torn or stretched ligaments so that they are better able to hold the shoulder joint in place. 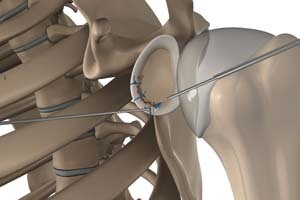 During the surgery the torn labrum is reattached back to the shoulder socket with the help of special anchors and the overstretched capsules and ligaments are tightened. Complications are rare after shoulder reconstruction surgery. Some of the common complications include infection, stiffness or restricted movement, nerve and vessel injury, failure of the procedure, and side effects of general anesthesia.